The sea level off most of California is expected to rise about 36 inches over the next century, an amount slightly higher than projected for global sea levels, and will likely increase damage to the state's coast from storm surges and high waves, according to a new report from the National Research Council (NRC). Sea levels off Washington, Oregon, and northern California will likely rise less, about 24 inches over the same period of time. However, a major earthquake (magnitude 8 or larger) in this region could cause sea level to rise suddenly by an additional meter (39 inches) or more. Gary Griggs, distinguished professor of Earth sciences and director of the Institute of Marine Sciences at UC Santa Cruz, is on the NRC committee that produced the report. "Global sea level has been rising due to both the warming of the oceans, which causes sea water to expand, and the melting of ice sheets and glaciers," Griggs said. "We know from tide gages that sea level rose globally about 7 inches over the past century. From satellite measurements over the past 20 years, however, we know that this rate has now nearly doubled, and we believe that this acceleration will continue well into the future." Sea-level rise is uneven, however, and varies from place to place. Along the U.S. west coast, an important factor is tectonic plate movements that cause the land to rise or sink in different regions, he said. An executive order signed by Governor Schwarzenegger in November 2008 directed state agencies to plan for sea-level rise and coastal impacts and asked the NRC to establish a committee to assess sea-level rise. Oregon, Washington, and several federal agencies joined California to sponsor the study. The report estimates sea-level rise both globally and for those three states for the years 2030, 2050, and 2100. For the California coast south of Cape Mendocino, the committee projected that sea level will rise 2 to 12 inches by 2030, 5 to 24 inches by 2050, and 17 to 66 inches by 2100. "Along most of the California coast, the average values for future sea level rise are projected to be about 6 inches by 2030, 12 inches by 2050, and 36 inches by 2100," Griggs said. For the Washington, Oregon, and California coast north of Cape Mendocino, the change in sea level is projected to range from falling 2 inches to rising 9 inches by 2030, falling 1 inch to rising 19 inches by 2050, and rising 4 to 56 inches by 2100. Lower sea levels are projected for this region because the land is rising, largely due to plate tectonics. At the Cascadia Subduction Zone, the ocean plate is descending below the continental plate, pushing up the coast. The committee's projections for the California coast south of Cape Mendocino are slightly higher than its global projections because much of the coastline is subsiding. The committee noted that as the projection period lengthens, uncertainties, and thus ranges, increase. 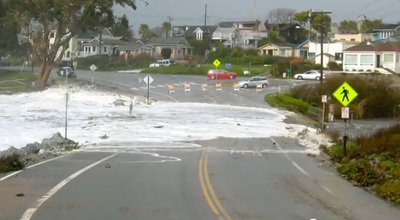 Most of the damage along the west coast is caused by storms, particularly the confluence of large waves, storm surges, and high tides during El Niño events. Significant development along the coast--such as airports, naval air stations, freeways, sports stadiums, and housing developments--has been built only a few feet above the highest tides. For example, the San Francisco International Airport could flood with as little as 16 inches of sea-level rise, a value that could be reached in several decades. The committee also ran a simulation that suggested sea-level rise could cause the incidence of extreme water heights in the San Francisco Bay area to increase from about 9 hours per decade, to hundreds of hours per decade by 2050, and to several thousand hours per decade by 2100. Extreme events could raise sea level much faster than the rates projected by the committee. For example, an earthquake magnitude 8 or greater north of Cape Mendocino could cause parts of the coast to subside immediately and the relative sea level to rise suddenly by a meter or more. Such earthquakes occur in this area every several hundred to 1,000 years, most recently in 1700. The study was sponsored by the states of California, Washington, and Oregon; National Oceanic and Atmospheric Administration; U.S. Geological Survey; and U.S. Army Corps of Engineers. The National Academy of Sciences, National Academy of Engineering, Institute of Medicine, and National Research Council make up the National Academies. They are independent, nonprofit institutions that provide science, technology, and health policy advice under an 1863 congressional charter. Panel members, who serve pro bono as volunteers, are chosen by the academies for each study based on their expertise and experience and must satisfy the academies' conflict-of-interest standards. The resulting consensus reports undergo external peer review before completion. More information on this report is available from the National Academy of Sciences.